In December 2014, we announced the launch of “a journal for those who consider linguistic curiosity both part of a profession and a unique way of life.” What a catchy phrase. And some of you might ask – why do we need yet another eJournal? 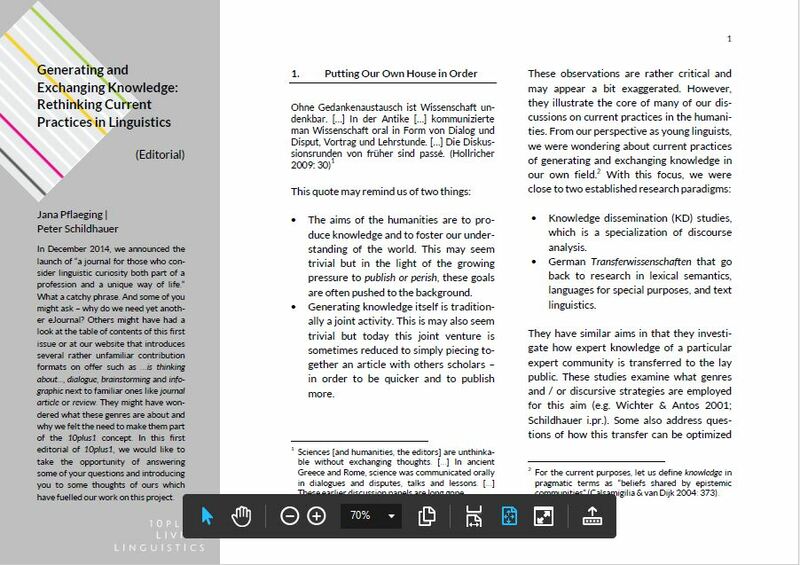 Others might have had a look at the table of contents of this first issue or at our website that introduces several rather unfamiliar contribution formats on offer such as …is thinking about…, dialogue, brainstorming and infographic next to familiar ones like journal article or review. They might have wondered what these genres are about and why we felt the need to make them part of the 10plus1 concept. In this first editorial of 10plus1, we would like to take the opportunity of answering some of your questions and introducing you to some thoughts of ours which have fuelled our work on this project. Peter Schildhauer studied gymnasiales Lehramt (German / English) at the universities of Halle-Wittenberg and Newcastle (UK). He received his PhD in 2014 for his thesis on the history of personal weblogs. His research interests lie in the fields of text- and media-linguistics, computer-mediated communication and digital education. Currently, he works as a lecturer at Bielefeld University. He is co-founder and editor-in-chief of 10plus1.